Who doesn’t want to be great – or rather be part of something great? I guess we are all interested… hence Jim Collins continued journey. He is back on this enduring quest in the fourth study in his series (following Good to Great, Built to Last and How the Mighty Fall). This time the exam question is a different lens into greatness – ‘How to build a great organisation in an unpredictable and tumultuous times?’ which you would have thought covered most industries. The authors claim that this look at 10X leaders (those that outperformed their industry by this much over a 15+ year period) builds on what they have identified before. Their ‘winners’ exemplify previously endorsed principles but the focus this time is on why they thrived in uncertainty and chaos, when others didn’t. They therefore studied players in the most volatile industries – ones experiencing changes in regulation, technology, price wars, serious restructuring or recessions. The focus predictably lands in technology, biotech and computing but also includes airlines and medical supplies. The conclusions are as ever interesting twists on common sense, well supported from a large data set, manipulated and examined by a large cast of analysts who support the endeavour. However, I am not sure that the lessons will stick with me in the same way as some of the earlier ones have, even though they ring true. Maybe they are just a bit too close to common sense to make quite so much difference. Maybe it is because I am (increasingly) led to think that effectiveness is less easily improved by another piece of insight or information than it is by a mindset set to curiosity and challenge. Nonetheless if you need a bit of a challenge checklist to the way that you operate and you use the book to help facilitate that then I am sure that it can help challenge some core operating principles very helpfully – and that is no bad thing in any organisation! 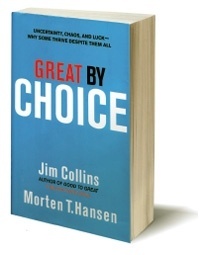 The book title gives you an idea of the overall conclusion – it is possible to deliver greatness even in uncertainty if you choose wisely. However, this choice is not the simple red or blue pill of Matrix fame. No – it is rather a set of different behaviours applied across the organisation and through time that help to build resilience and greatness. Intriguingly these behaviours do not match the nostrums of some analysts which might focus on creativity, vision, ambition or big bold moves as keys to making your enterprise more successful than the next. The study suggests these sorts of things are only hygiene factors – not the differentiators of greatness. The key behavioural traits are more about the way that the organisation responds to a very uncertain environment. The authors summarise these in three themes – fanatical discipline (unrelenting consistency of action), empirical creativity (an evidential focus – test and learn) and productive paranoia (environmental sensitivity channelled into contingency planning). All three built around Collins’ famous ‘Level 5’ ambition for a great cause on which the enterprise is focused. The authors see this as the most important differentiator of the really great from the perfectly average organisations in their study. They describe this as a set of highly specific attributes, largely within the organisation’s control, that provide clear performance standards and constraints (that operate even when they could do ‘better’ short term) applied over an appropriate timeframe for the operation. These attributes can relate to finance, learning, service or whatever is the priority for the nature of the organisation and its proposition. The key is that it is sustained long term (10+ years) and that it is disciplined – rain or shine. Consistency is its distinguishing feature. The suggestion is a kind of operational strategy that sets a consistent agenda for action over through time – e.g. a constant style and pattern of product innovation delivered incrementally throughout the period without the switches or changes of priority that organisations often exhibit. Each time delivery is measured against clear standards and with a predefined strategy for what happens next. This axiom is an endorsement of companies investing in learning as the base for innovation. The approach is to make low-cost, low-risk bets that enable the organisation to build a body of empirical evidence that will shape and focus major investments. Hence the ‘bullets’ – small tests that can be fired without disrupting the organisation but which will provide important insights into where and what kind of ‘cannonballs’ to fire subsequently. The key is to ‘cast enough bread on the water’ to find some success that can then be used to shape a calibrated big bet (a cannonball) with significant resources behind it…and not to fire a cannonball without this learning. This operating principle fights the temptation to make big bets behind inspired guesses or to become so risk averse that the resources never get spent behind bigger plays despite the evidence provided by earlier experiments. The winners in the analysis were not more innovative than the rest – but better targeted and more measured in execution. This targeting was led by the learning gathered through creative experimentation and was done consistently. This is the Collins & Hansen prescription for paranoia. This is the storm preparation – management that is vigilant and scenario smart. It has three key dimensions – Buffers (cash reserves to provide contingency for adverse events), Bounded Risk (being aware of and managing carefully risks, especially those that might kill the organisation, are downside weighted or which cannot be controlled) and Zooming (‘out’ to sense threats that might severely undermine plans and ‘in’ to refocus energy into goals in the light of these). Quality is not so much speed of response as effective calibration of the environment and the risks attached to the business and then an ability to take these insights into coherent and disciplined execution. Rigour rather than agility is emphasised with an attitude that organisations need buffers to withstand a volatile environment – the 10Xers carried 3-10 times as much cash-to-assets as comparators. This stands for Specific, Methodical and Consistent. It is the operationalisation that turns a strategic concept into reality with discipline. It is Collins’ view on how to turn his previously described ‘Hedgehog’ concept into specific actions, actions that build and sustain momentum on its proposition. The recipe includes things that the organisation will and wont do (eg Southwest Airlines will stay focused on short-haul and fly only 737’s – not anything else, it will stay out of food services) and represent the operating principles against which everyday decisions will be made. If well chosen they sustain high standards in even extremely challenging environments and as the authors note even in the face of a strategic shift, such as the one made by Intel into microprocessors in the 1980’s. The above summarises the key messages in the book. Much of the rest of the page count is taken up with explaining the study methodology and participant selection or the relevance of ‘luck’ to sustained success (The answer here being that it is not whether you are lucky or not but how you respond to lucky/unlucky events to ensure that you create a great return). Perhaps the most interesting of these is the chapter on FAQ’s!